As anyone who has followed this blog will realize, I spend a lot of time at Flagstaff Mountain. The reason for this is not merely convenience however. Given the proximity to one of the world's must competitive climbing scenes, one would expect Flag to be totally climbed out, especially since 50 years of bouldering history have unfolded there. Such is not at all the case however and I have been diligently filling in the gaps and getting some really good training in as well. A recent project was a L to R traverse on a wall a bit north of First Overhang, where the Mateus High Step Traverse is. This traverse has some of the most continuous crimping on the mountain and its sole flaw is the good sized foot ledge at the base. However if you want to do an interesting and steep V9 line on incut edges check it out. There are literally dozens more lines, traverses, and variations in solid double digit territory on the mountain. The prejudice that many have against climbing here has allowed some very interesting and difficult problems to go untouched which is a shame. A legacy of misinformation and sandbagging has only exacerbated the problem. Thank you, Chip Philips, for selflessly sorting out truth from fiction. A quick session at CATS this morning was cold and pretty miserable but after putting Sophia down for her nap, I worked out a bit downstairs on the weights and fingerboard. I have a 1/8" and a 1/2" thick wood strip that I use for hangs, weighted hangs, one-hand hangs, pull-ups, regular and weighted, and front levers. I am up to 20 regular pull-ups on the 1/2 and 10 on the 1/8 edges so far. There was an item in the newest issue of Rock and Ice (but don't bother with going to the website; it's not very good) from Julian Saunders, an osteopath from Australia about weighted pull-ups which I think was rightly blasted by Sonnie Trotter at his blog. Saunders argues that weighted pull-ups are useless for climbing, that they aren't sport-specific. I can't understand this position because by that logic, sprinters, for example could only get stronger by running fast, not by explosive power workouts in the gym. If you are genetically gifted with super-strong fingers or can spend endless days on hard problems, I suppose gym training is redundant. And there is no doubt that returns can rapidly diminish and injuries result. But I agree with Sonnie on this, there is no better way to radically improve finger strength than adding some weight and trying to hang on. question: do you do repeaters or take rests and go for max strength hangs? i've seen alot of training regimens promote the former, but i've always felt they fall squarely into the p-e training camp. also... what kind of rests do you take on the crimp pull ups? My usual routine is to see how long I can go on the small holds, which with weight is rarely more than a few seconds, rest a few minutes, and try again. 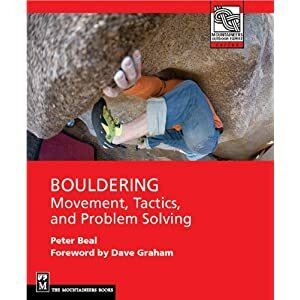 Maximum recruitment is the goal so you want to be reasonably fresh for each try, a lot like bouldering. For the pull-ups, I typically rest five minutes or so, maybe ten, again hoping to be reasonable fresh and able to dig deep on the last few. Very cool. Does this line start on the left side of the west face, traverse the slopers, through the roof, and top out immediately on the arete (v3) before the south face, or continue through the south face and gain the furthest right arete (which i believe angles/surfs back left slightly)? PS: we really gotta start shooting these! It goes below the lip on sharp crimps to join the arete. I plan on trying the R to L version at some point. I definitely want to get some photos. i will never understand how folks can one-arm hang anything less than an inch thick and incut. my training/sending future is dismal. i would agree that adding weight seems to help quite a bit. when i was my strongest last year, i the spring, it was because i had been wearing a homemade weight belt that only added a few pounds... maybe four at most. regardless, it seemed to make just the right bit of difference when i climbed without it. i think that if you get too heavy on the weights, you're asking for trouble, though. my finger joints, elbows, and knees [from hooks, moderate drop knees, and high stepping on my 60 deg wall] did ache more when i tried to add more than just the little belt. as far as those onearm hangs, though... someday i will understand this working out thing better... or at least i hope. I typically use 40-50 pounds extra when doing hangs and pull-ups. For really small holds on steep walls the better you can offset the hold size with raw power, the better you can use technique to take care of the rest. I would not recommend climbing with a weight belt however as that changes the nature of your movements and alters the muscle patterns you need to build. One arm hangs (or pull-ups) I am thinking are a mandatory training skill for anything really hard and steep. The ability to take a single hold and reach really far off it on a steep surface is imperative. However they are stressful on shoulders and elbows. Nice send Peter. I agree, there are tons of variations possible on that wall. A fun one is to traverse R to L on the sloppy lip itself until all the way right, then straight up. Also, L to R, around the corner on the sloppy lip to top out on the mantel/highstep problem in the groove on the far left of the boulder.